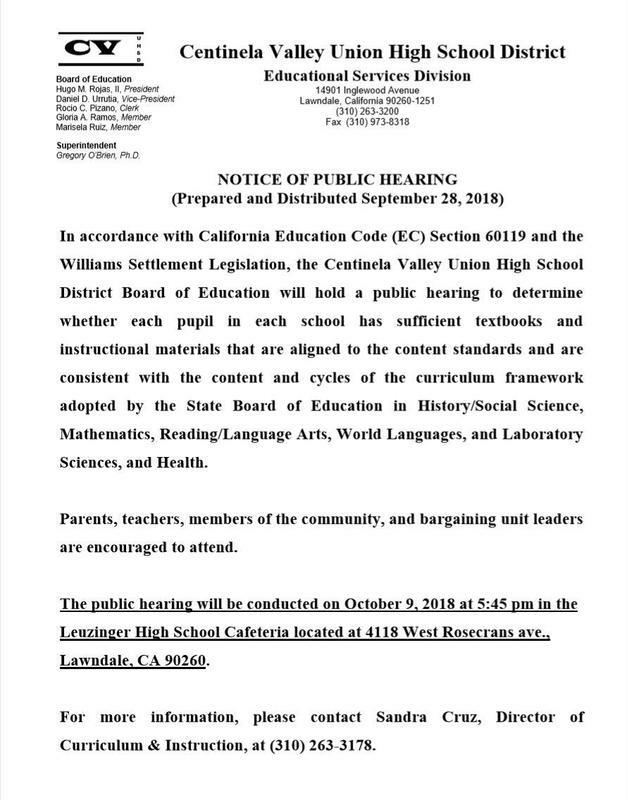 In accordance with California Education Code (EC) Section 60119 and the Williams Settlement Legislation, the Centinela Valley Union High School District Board of Education will hold a public hearing to determine whether each pupil in each school has sufficient textbooks and instructional materials that are aligned to the content standards and are consistent with the content and cycles of the curriculum framework adopted by the State Board of Education in History/Social Science, Mathematics, Reading/Language Arts, World Languages, and Laboratory Sciences, and Health. Parents, teachers, members of the community, and bargaining unit leaders are encouraged to attend. The public hearing will be conducted on October 9, 2018 at 5:45 pm in the Leuzinger High School Cafeteria located at 4118 West Rosecrans ave., Lawndale, CA 90260. For more information, please contact Sandra Cruz, Director of Curriculum & Instruction, at (310) 263-3178.